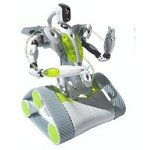 Telerobotics is the area of robotics concerned with the control of robots from a distance, chiefly using wireless connections (like Wi-Fi, Bluetooth, the Deep Space Network, and similar), "tethered" connections, or the Internet. It is a combination of two major subfields, teleoperation and telepresence. 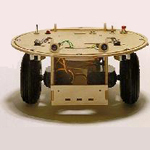 Once submitted, we will try and place you in contact with a suitable Telerobotics supplier within 48 hours. Grips Brokk 90 from Kraft TeleRobotics, Inc.
Wireless Dangerous Eliminate Robot from Homedense Corporation. 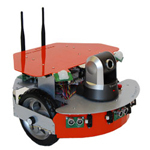 TJ Telerobotics from Mekatronix, Inc.
Spykee The Wifi Spy Robot from Borgfeldt (Canada) Ltd.
ANATROLLER ARE-100™ Telerobotics from Robotics Design Inc.
4WD WiFi Controlled ATR from SuperDroid Robots Inc.
Rovio™ Mobile Webcam from WowWee Group Limited. 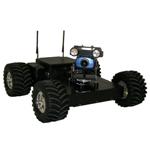 X80SV WiFi Mobile Robot from Dr Robot, Inc.